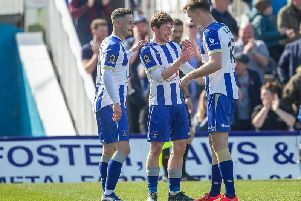 Hartlepool United welcome AFC Fylde to the Super 6 Stadium this evening - but what should they expect from the promotion-chasing side? Pools will be looking to put an end to a disappointing run of form which has seen them fail to win in their last eight games in all competitions. But they will face a tough test against an AFC Fylde side with designs on promotion to the Football League - and armed with an array of goalscorers. So what should Matthew Bates and Pools expect this evening? What system will AFC Fylde play? Fylde tend to line-up in a 4-3-3 formation, with some advanced midfielders ensuring they can cause some real problems going forward. A solid back four - with plenty of experience at this level and higher - provides a strong base and will be difficult for Pools to break down. With pace aplenty out wide, and wicked delivery to match, there will be plenty of service for Fylde's prolific frontmen to feed off. Who are AFC Fylde's key players? One man in particular is always mentioned in the same breath as Fylde - and that's star striker Danny Rowe. The former Manchester United youngster has been prolific for the Coasters and was the subject of six-figure bid from League One side Cheltenham over the summer. He has 13 goals to his name already this season and, alongside fellow former Red Devil Danny Philliskirk, ensures that Fylde have a potent threat in front of goal. Further back, defender Neill Byrne is vastly experienced and so too is James Tunnicliffe - the pair excelling together at centre back. Also worth looking out for is Arthur Gnahoua, a forward who joined the club on loan from Shrewsbury yesterday. Do AFC Fylde have any injury worries? The Coasters will be without captain Lewis Montrose who has only just returned to training after a long-term injury. Danny Kane and James Hardy will also miss out, but experienced midfielder Andy Bond could return to the fold. Who is AFC Fylde's manager and what can we expect from them? Dave Challinor is the man in charge at Mill Farm, and has been since 2011. Challinor's only previous managerial experience came at Colwyn Bay, but he has been quick to impress at Fylde and has led the club on a journey up the non-league pyramid. Now knocking on the door of the EFL, the 43-year-old's attack-minded approach seems to be paying off. That, coupled with some fine recruitment, has seen Challinor become one of the most promising young managers in the lower leagues. What form have AFC Fylde been in? Tipped by many as outsiders for promotion this campaign, Fylde have lived up to their billing thus far. The Coasters currently sit sixth in the National League having lost just two of their last six fixtures in all competitions. Indeed, the North West side have lost just three times all season and will be keen to avoid another negative result at the Super 6 Stadium.